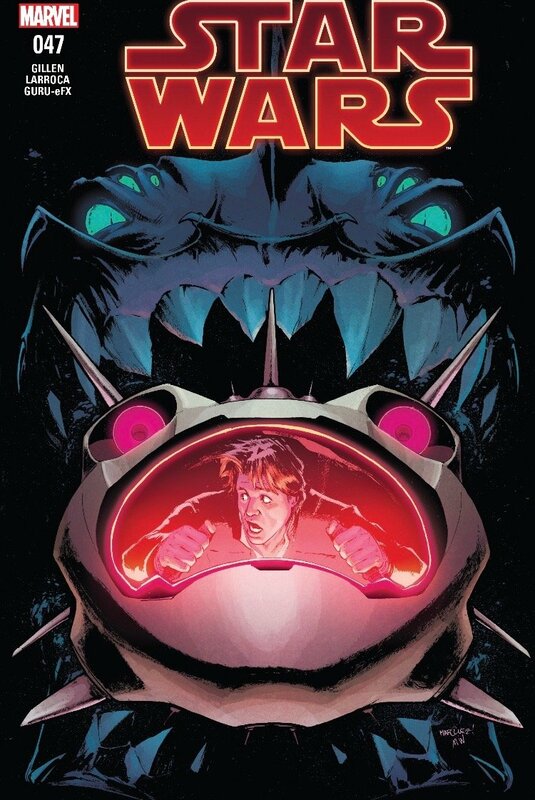 Discussion in 'Star Wars: Books & Comics + Legends' started by SWNN Probe, May 3, 2018. 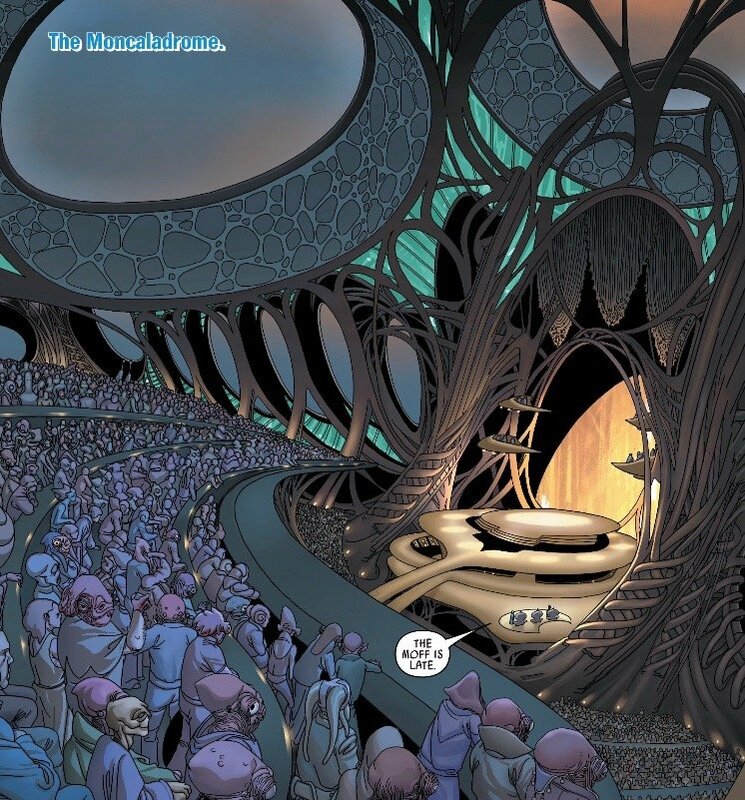 This issue opens in a grand opera hall, the Moncaladrome, with all the Mon Calamari audience awaiting the arrival of Moff Hubi, so the show can start. Threepio is playing master of ceremonies, while Queen Trios awaits the arrival of Moff Hubi. The only thing is it's not actually Moff Hubi, it's the decoy shapeshifter that Leia liberated to impersonate the moff. While the decoy takes in the opera, the real moff is elsewhere with our Rebel heroes. You'll remember Urtya – Warden of Mon Cala in the stead of King Lee-Char – was opposed to any rescue operation and alliance with the Rebels. 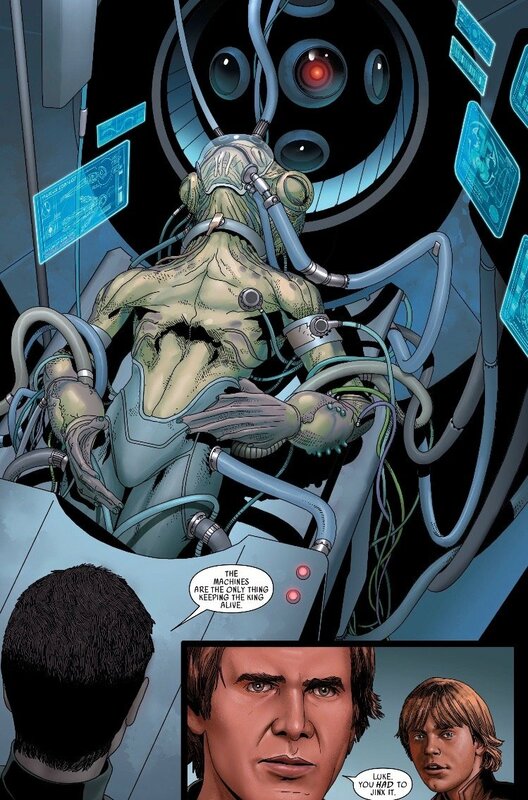 He's seen the bloodshed that we are currently witnessing in Charles Soule's Darth Vader and is only interested in maintaining the status quo to keep his people safe from any Imperial retribution. He's not going to run out and kiss the hand of the moff, but he's also not interested in making small talk, since Trios hasn't let him in on the plan. The opera begins, and it's one you will recognize, for sure. Meanwhile, on another water world, Strokill Prime, Han is having a heck of a time navigating the dark oceans. If there's always a bigger fish, I'd hate to see what could outdo the one hot on their tale. They've just arrived and this big monster is their welcome wagon. While the REAL Moff Hubi is freaking out, Han is trying to find away around this aquatic beast. Luke realizes the fish is attracted to light, so he has Han kill all the lights, suits up in deep dive gear, and exits the craft to create a diversion. 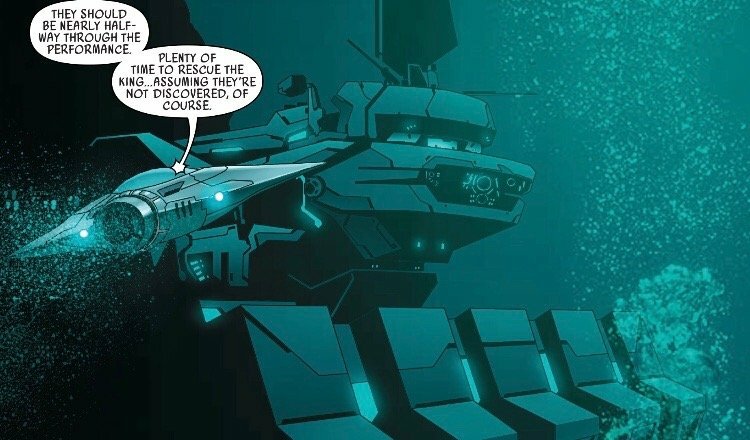 Honestly, this little plot device is kind of silly, but Luke seems to think the diversion will work and is prepared to risk himself so they can get to the underwater prison holding the Mon Cala king. Luke's diversion is his lightsaber and the Force. It's not clearly explained what exactly his plan was, but I'm assuming he tried to subdue the beast with a combination of distraction and reaching out to soothe it's temper through the Force. Kind of cool, now that I think about it. He drives the monster away from the ship and into an underwater mountain, just as Chewbacca intervenes to spirit Luke back to the ship. Han and crew are pretty impressed, but he scolds Luke to never do it again. It's nice to see Luke using the Force when he needs to, but that he's still put his endeavor to learn more about the Jedi on hold so that he can help the Rebel Alliance with its fight against the Empire. It's also a pretty big sacrifice he's willing to make to help a king he has never met – though he doesn't know his father, mother, and mentor put a lot of their own energy into helping him get his throne (see Clone Wars season four episodes 'Water War', 'Gungan Attack', and 'Prisoner' for that story). 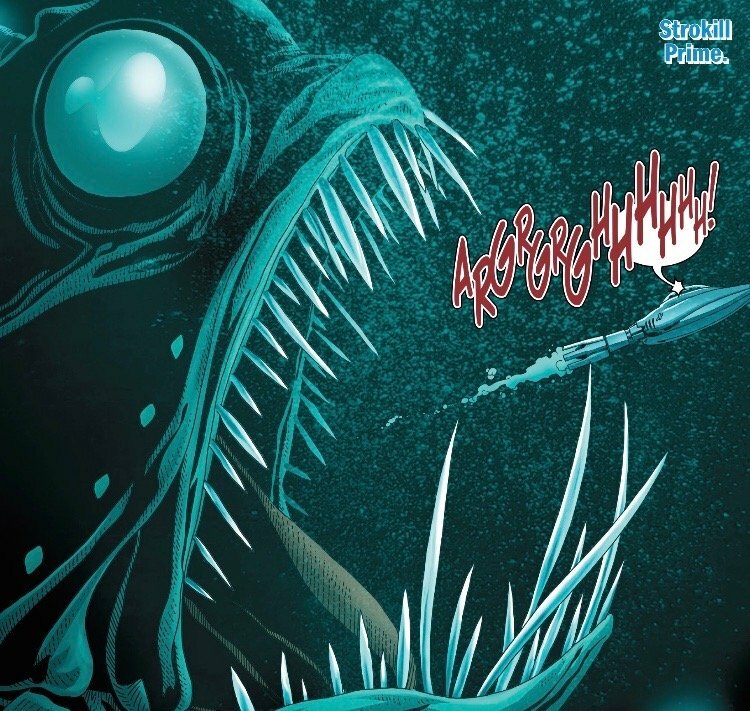 They reach the underwater prison, but the clock is ticking. This reminds me of Mission: Impossible, where they have only a finite amount of time for the impersonator Moff Hubi to keep any suspicion from his Imperial colleagues at bay. Faux Hubi just realized that he doesn't get to just sit back and watch the opera. It's intermission, and the local bureaucrats are going to want a cocktail and a conversation. Faux Hubi has Threepio feed him conversational lines and responses, in one of the more humorous scenes I can remember from this series. Threepio has spent enough time with enough people in various parts of the galaxy to help shepherd faux Hubi through a couple conversations. It's interesting to see some of the conversational cues, as the impersonator makes his way through the room as the guest of honor. Real Moff Hubi is in a much darker place. He seems to offer our Rebel friends one last chance, because he believes they have no chance of getting what they came for. Cold confidence like this always makes me tense, just before the climax of a story. Especially when it comes from an Imperial officer, directed at these three, who are just about to break into an Imperial prison. Hubi knows something they don't, but Leia insists that hope is something the Empire can never take from them. That's certainly true, but his confidence made me skeptical that this was going to work out. Chewbacca throws the moff over his shoulder and carries him, as the others blast their way through the facility. It should be noted that they all have their weapons on stun. Since this is a surprise attack, they must realize it would be straight up murder to shoot a bunch of Stormtroopers in the back. Maybe it's that, or it could be they don't want to set off in any alarms. My belief lands somewhere in the middle. The whole reason the moff is along: use his face to gain full access to the prison. Now this is not what I expected. With the release of the other bookend of the Mon Cala struggle coming next week, I suspect we will learn how Lee-Char came to be in this state. It's really sad to see the king has fallen this far. Especially after everything he went through to free his people from Separatist rule during the Clone Wars, his fight against the Empire in Darth Vader, and that he holds the fate of whether Mon Cala will join the Rebel Alliance. As much as I love the Darth Vader series, I'm kind of dreading seeing how this went down in the next issue or two. If you're enjoying this series, I encourage you to visit The Clone Wars episodes I listed above, as well as Darth Vader. You'll be a Mon Cala buff in no time. Pretty good issue. Short and to the point, as well as entertaining enough. We're moving through this arc nicely, and I feel the characters are just where they need to be. 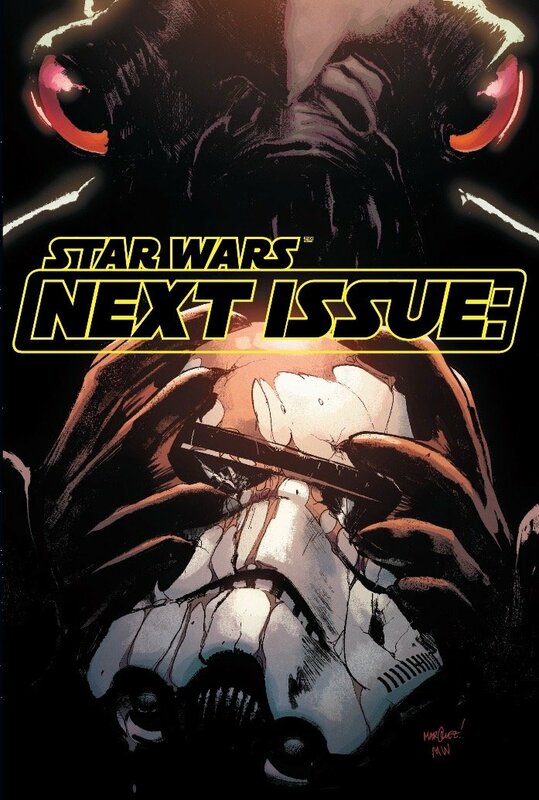 Writer Kieron Gillen mentioned by July we are going to be very close to the events of The Empire Strikes Back and will eventually bleed into them. This arc is to no doubt establish how the Rebel Alliance built it's fleet, as well as flesh out canonical history of a world huge in Star Wars lore. 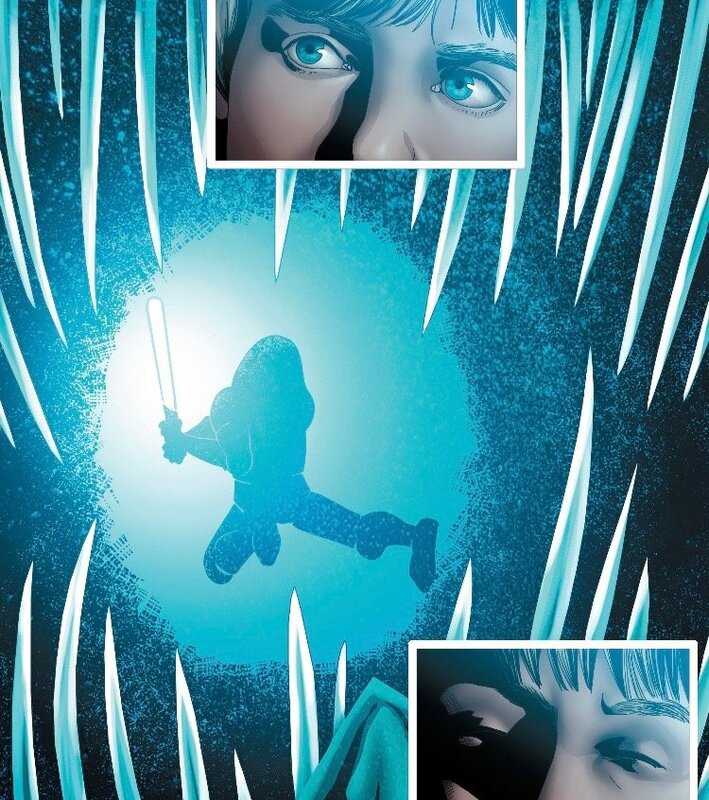 Gillen is doing a great job, and I even enjoyed the art by Salvador Larroca and colorist Guru e-FX. I'm looking forward to the conclusion, in which I hope they can save Lee-Char and start the liberation of Mon Cala. Really cool cover, I love it when a plan doesn't come together. The Resistance Broadcast - Episode IX: Are All of the Resistance Heroes Going to Jakku?